Irfan in some Middle-Eastern languages is a given name that roughly translates to “wisdom“. It’s also the name of this band from Sofia, Bulgaria, whose sound takes us on a great journey from Sahara to the Black Sea via the Balkans. Their previous two albums were released quite some time ago (2003 & 2007) from the same French label that also took care of ‘The Eternal Return‘ named Prikosnovenie, which focuses on ethereal and ethnic music from around the world. In this album Irfan present us ten songs that openly accept and at the same time project their influences, while floating towards distant ages and places. Using an abundance of sounds, coming from either baglama and santoor or varieties of percussion and traditional wind instruments they create an atmosphere upon which Denitza Seraphim‘s vocals are layered. Occasionally they get carried away to faster, ecstatic tempo, like on ‘Salamander‘, but they’re usually closer to smooth and nostalgic melodies. The lack of lyrics works for the best, letting the wonderful music they create fully exposed and in charge of everything. If they are to be compared with any other more popular band, that ’ll have to be Dead Can Dance, who are one of their major influences. 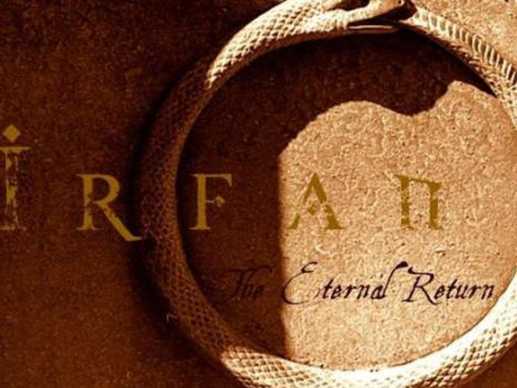 One of the songs that stand out is ‘The Golden Horn‘, but ‘The Eternal Return’ is a journey best enjoyed from start to finish.